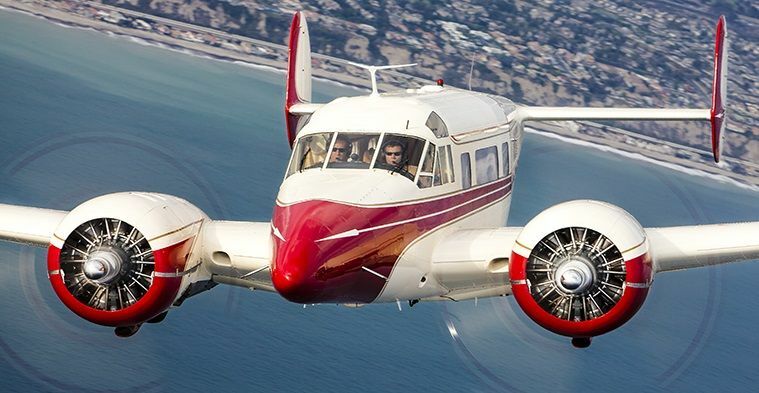 Beginning in 1937 as the Beech 18A, Beechcraft designed and began building a magnificent new twin-engine, 6-11 passenger aircraft that could be configured either as an airliner or as an executive transport. This aircraft is now affectionately known by the pilots who fly them simply as the Twin Beech. These aircraft have earned their place in aviation history as one of the most successful aircraft designs ever created due to its ability to mold itself to the needs of many types of customers. The Beech 18 is the world record holder for the longest continuous production of any piston-engine aircraft. During its 32 years in production, ending in 1969, nearly 9,000 aircraft were built with over 200 approved modifications and 8 different models seating up to 11 occupants. They have made improvements to the design over the years making the later models of the Beech 18 carry more weight, more fuel to fly further and faster than earlier models. Our Beech Super 18 (BA-335), N90TT, was built in 1957. This aircraft started out as a tail dragger but was converted to a trigear with the Volpar Conversion in 1961. N90TT was modified with many approved upgrades over the years making our aircraft officially an E18S-9600, which means we can takeoff at gross weights up to 9600 pounds. N90TT is fitted with two, supercharged Pratt & Whitney R-985 Wasp Jr. engines that generate 450 HP each. The P&W R-985 radial engine is the definitive and most reliable radial engine ever built. This engine is the most powerful radial engine that can been installed on the Beech 18. The Twin Beech can be configured in many different ways with up to 9 seats in the cabin. Ours is configured as an executive civilian transport with club seating (4 seats facing each other) for a more relaxed and comfortable seating arrangement. We also have a bench seat at the right rear of the cabin for 2 smaller passengers. N90TT also has a private lavatory in the rear of the cabin. N90TT, can also accommodate up to 300 lbs of baggage in the cargo compartment at the rear of the aircraft. N90TT underwent several extensive restorations over the years. The first major restoration began in 1994 when BA-335 received a complete nose to twin-tail restoration taking over two years at a cost of over $500,000. The aircraft received 2 overhauled engines from Covington Aircraft with low time matching cranks, a new cockpit instrument panel with new upgraded avionics including a Garmin 530W and a color weather radar installed in the nose. N90TT was fitted with a brand new full leather custom interior. She was stripped and repainted with a custom vintage paint job. The entire aircraft had several more airframe modifications to increand fuel capacity to 318 gallons. Modern new Cleveland brakes were installed like on the KingAir 200. Twin Beech N90TT was repainted again and received more interior upgrades in 2008 when she was stripped, repainted, and had her interior completely reworked and brought back to new condition with a classy 1950’s leather and Brazilian Rosewood motif. We are very proud of our incredible 1957 Beech Super 18, N90TT, and we look forward to sharing the magic of luxury flying in the 1950s with you in this incredible piece of flying history. 48 gph @ 10000 ft.